Traditional Indian weddings are a thing of beauty. Built on the fusion of religious beliefs and the need to celebrate the event with as much pomp and glory as they can, Indians have made wedding highly appealing, if not entertaining, visually. The thought that goes into every aspect of the wedding decorations, including the flower decoration for the wedding transport and the reception stage decoration, is phenomenal. For even the simplest of traditional weddings, guests are bombarded with elaborate arrangements of fresh flowers, beautiful mood lighting and excellent food. D.Chandirrasekar Decorations can help you select the experts you will need to celebrate your big day in the way you deserve. The grandeur and opulence of a traditional wedding is rarely matched. 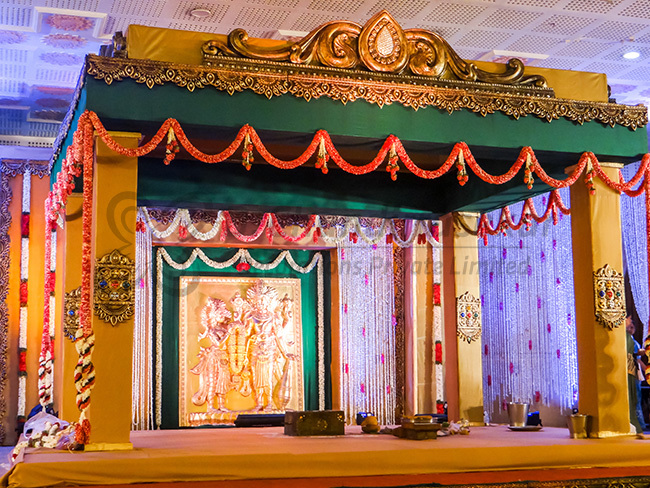 From booking the marriage halls in Chennai, the unmatched wedding flower decoration of the marriage hall and the stage, to the several courses of traditional food catered, the unmatched wedding flower decoration of the marriage hall and the stage, including church wedding decorations and stage decoration for reception, to deciding on the most appropriate return gifts, D.Chandirrasekar Decorators will leave no stone unturned in giving you the experience you’ve been waiting for. Often, decorators will have to resort to using cheap artificial flowers to compensate for the sheer volume required to run a wedding event. However D.Chandirrasekar Decorators understand that there can be no compromise in the quality of your purchase. We source our raw materials locally so that the result that was promised is the result we deliver. Don’t just take our word for it – browse through our gallery to see our history of happy customers. You will come to know that not only do we help undertake these momentous events, we find joy in sharing them with you and making every second picture perfect. With D.Chandirrasekar Decorations, you cannot go wrong.